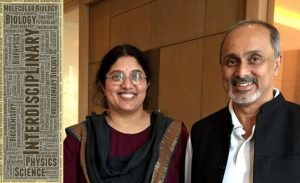 In this article on interdisciplinarity, Gautam Menon, theoretical physicist (The Institute of Mathematical Sciences, Chennai & Homi Bhabha National Institute, Mumbai) and Sandhya P Koushika, neurobiologist (Tata Institute of Fundamental Research, Mumbai) provide critical insights on tackling interdisciplinary problems, gained from decade of steadfast collaboration. Before a physician, a reverend priest. These lines are from a letter written by the poet Mirza Ghalib in 1858, quoting a Persian verse. The sense of imposter syndrome that they evoke affects, sooner or later, all scientists whose work crosses disciplines. Here, we describe what drove a theoretical physicist and a C. elegans neurobiologist to collaborate and what they each gained from it. On both sides, this was the first attempt to bridge such a stark disciplinary divide. Each story of a successful interdisciplinary interaction is different. There are no easy guides to making things work. However, what we say here may be more generally useful to others interested in starting interdisciplinary work, perhaps even with a specific collaborator already in mind. Our own example shows that the benefits of interdisciplinary approaches can be transformative, even if initially accompanied by feelings of imposter-hood. Our work together began at an interdisciplinary meeting on traffic, organised about a decade ago at the Indian Institute of Technology (IIT) Kanpur. The term “traffic” covers a surprising number of contexts, from vehicular traffic to the traffic of vesicle-encapsulated cargo by molecular machines within cells. These machines are molecular motors, driven by ATP hydrolysis. Theoretical physicists have devised a number of models for such motor-driven cargo transport. Almost all such models avoid the complications of experimental systems, elevating elegance and simplicity over the messiness of the real world. But complexity in biological experiments, given inherent variability and experimental caprice, is the norm, unlike physical measurements where error bars can often be so small as to not be worth even displaying. The question that seeded our work together was the following: in experiments which tracked cargo motion within specific nerve cells in live C. elegans worms, such cargo inevitably wound up entering regions where other cargo had stalled. Once moving cargo came up against a stationary cargo cluster, it was unclear what happened to them. Sometimes, such clusters appeared to emit more cargo than the numbers that came in. At other times, they seemed to be able to accumulate more than they released. We now believe that we understand this observation (Sood et al, Traffic, 2018; The Hindu provides a popular take). Our conclusions have been tested in detail in simulations. But to achieve this understanding, theory and experiment first had to play off against each other, with the model suggesting specific measurements and analysis. The experiments acted as a brake, discouraging unanchored theoretical speculation. Theory both drove, and in turn was driven by, the experimental observations. Several other observations and predictions from the simulations led to questions that continue to intrigue us today. For the physicist, the experience of dealing with the messiness of real biological data coupled with the clumsiness of biological tools (as in, “You mean we can’t just find out what it’s doing in a cluster by looking at it?”) was new. So was experiencing the intuition of the biologist for the many processes that could explain the observations as well as the careful enumeration of different tests that one could do to eliminate or confirm each of them. For the biologist, the idea that one could and should step back to look for over-arching principles that might be general (or even, as physicists like to say, “universal”) outside of a narrow context was novel. With this background, our first piece of advice: Finding the right scientific collaborator is key to any successful collaboration. Identifying the right problem is equally important. The interaction must also work both ways: A collaboration that is one-sided, in commitment or in intensity, will simply not survive in the long term. Having a shared sense of adventure and the ability to take risks, helps. Most collaborations across disciplines start in plug-and-play mode, as in “experimental data with specific method meets new way of analysis or alternative method”. They are good routes to easy papers. However, they may never transition into problems with a longer horizon because neither partner needs to step out of their zone of comfort. We will reserve the term “interdisciplinary” largely for those situations where both collaborators accept the need to deviate from established disciplinary paths as well as to deal with the intellectual disruption that results from such a change. Our second lesson: It takes time, energy and hard work to be interdisciplinary. The best and worthiest problems rarely come pre-packaged; if they did, practical problem solving would be the larger part of the interaction. The interactions that led to our first paper took years. Much of this time was spent in discussion and arguments, as well as in learning each other’s language. We spent time with each other’s students, post-docs and project assistants. This had positive consequences. The biology students learnt new ways of thinking about data. Students with a physics or a computational background understood the complexities of an actual experiment and the crucial role of experimental skill and perseverance. The collaboration has significantly transformed students in the Koushika lab, who have learnt to pay far more attention to numbers, as opposed to qualitative behaviour, than they did earlier. The more courageous among them have even attempted simple simulations, realising their value in developing the right intuition. Those on different sides of a collaboration must also realise that there are aspects to the other field that will seem simply incomprehensible on a first encounter. For example, to a theoretical physicist, the idea that very similar proteins with virtually identical functions can have entirely different names in different model systems can be a source of discomfort. To realise that they will have to make some effort to learn these names is disturbing. To the biologist, the physicist’s constant desire to side-step the details and look at the “larger picture” can be a source of frustration as well as not infrequent irritation. Members of Sandhya Kaushika’s lab at TIFR hard at work at data analysis (left) and science outreach (right). 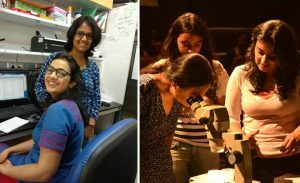 Parul Sood (pictured in both images) took the collaborative study on cargo trafficking in neurons to completion. Our third piece of advice: Be open to new experiences. The act of an interdisciplinary collaboration involves painful personal exposure, the repeated feeling of understanding nothing in a new field and wondering if the journey will be useful at all. The Nobel prize-winning physicist P.G. de Gennes, a pioneer of cross-disciplinary science, puts it beautifully : “.. every time one switches to a new field, one has to catch up with the rest of the class, to learn all over again from scratch … To change research fields is as traumatic as moving to another country.” The only real way to deal with this trauma is to embrace it head-on. At a practical level, this might mean forcing yourself to go to scientific meetings where your collaborator might be the only person you know, certainly at the outset, and where most of the proceedings could be entirely opaque to you. Another way to do this is to participate actively in the writing of manuscripts from beginning to end, rather than confining yourself to just those sections which include your contributions. In difficult times, it is good to remember that the true value of a good collaborator is that they help you find your way around complex literature, sort out elementary confusions, and inject the right note of positivity into your interactions. Fourth: Be confident that you have something new to contribute. 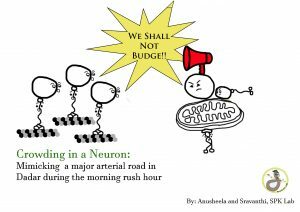 It is easy to feel that a collaborator has sufficient momentum to carry on on their own, and that they would be less encumbered by a bumbling coauthor to weigh them down. This is where one’s confidence in what one brings to the table is crucial. Only then can a scientific interaction attain its natural state of flow. We were lucky that neither of us felt that this was particularly a problem. Both of us had other things to work on as well, so our own scientific advancement was not tied solely to whether we would achieve something publishable in the short term. Working in the Indian context also meant that we could look beyond the grant cycles that factor into the practice of science in much of the first world. This certainly made our collaboration easier, since we could afford to be open-minded in identifying questions of interest. Fifth: Communicate your joy and excitement at working together. Realise that your collaborator needs, as much as you do, a feeling of validation and excitement. Again for us, as a consequence of the long periods of discussion that preceded our even understanding what the core problems were that we wanted to address, this came naturally. But for others, in different situations, a more systematic approach to keeping the excitement alive might help your collaborator as much as you. Sixth and finally: The best interdisciplinary interactions are those where the problem matters, not so much the method. A set of tools and our own way of thinking define us, certainly for experimentalists but also for the theoretically inclined. When we encounter a new problem, we fall back upon what we know, translating what we must learn and understand into familiar terms. This is a reasonable starting strategy, but one that is sometimes not optimal for long-term success. A tool sharpened and adapted for one problem may simply be too blunt for another. The need for flexibility and adaptation lies at the core of making interdisciplinarity work for you. What should we expect to gain from interdisciplinary interactions? From de Gennes again, “I cannot emphasise enough the importance of … transposition of methods between two apparently unrelated fields of science. What has been learnt in one field can at times help completely solve different problems”. At a subtler level, it is also the value of attempting to answer the sorts of questions that children or total novices could put to you about your field, except that it is your collaborator who might be asking them and perhaps with a specific purpose in mind. As every scientist knows, these are the questions that are often the most difficult to answer, but that also wind up teaching you the most. For both of us, looking back on close to a decade of interactions, much of which was spent in adjusting to the philosophy, language and practice of another, very different field, we can agree that this was time well-spent. Gautam Menon is a Theoretical physicist who works at The Institute of Mathematical Sciences, Chennai & Homi Bhabha National Institute, Mumbai. Sandhya Koushika is a neurobiologist associated with Tata Institute of Fundamental Research, Mumbai. This article was first published in IndiaBioscience. Full text available here.